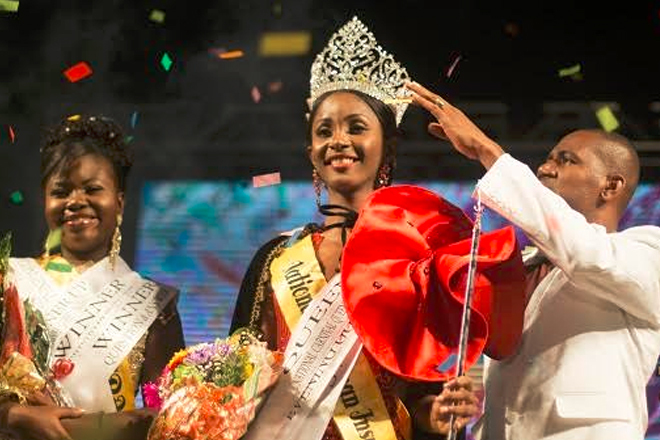 (ZIZ News) — A new National Carnival Queen has been crowned following an eventful competition on Wednesday night at Carnival Village. Katherina Davis, Miss National Caribbean Insurance Co Ltd has been officially crowned the new 2016-2017 National Carnival Queen. The large crowd at the Sugar Mill erupted into cheers and applause as Davis took the top spot, snagging Miss Photogenic, the Evening Gown Appearance segment, the Swimsuit Appearance, the Interview segment and the Chairperson’s Award, amassing a total of 1224.5 points. Nordia Demming, Miss St. Christopher Air & Sea Ports Authority captured the 1st runner up position with a total of 1147.5 points after winning the Question & Answer segment along with the Performing Talent segment. Demming was also awarded the Miss Amity award. Shantara Hewlett, Miss St. Kitts-Nevis-Anguilla National Bank secured the 2nd runner up position with a total of 1079 points. Jonieka Smithen, Miss Carib Brewery (St. Kitts/Nevis) captured the award for best National Pride appearance. Comedian and social media personality Toni “Bella” Blair out of Jamaica was the featured guest host at the pageant. Bella Blair also used the opportunity to perform through song to entertain the audience.